Hi guys need advice please. I've been paying a debt for a car that I bought on HP over 10 years ago. Long story but I was conned and fell hook line and sinker. I've been paying every month a small amount to appease Vauxhall and I've now received the attached documentation. Do i need to change payment through my bank ? Will they now contact me to ask for more ? 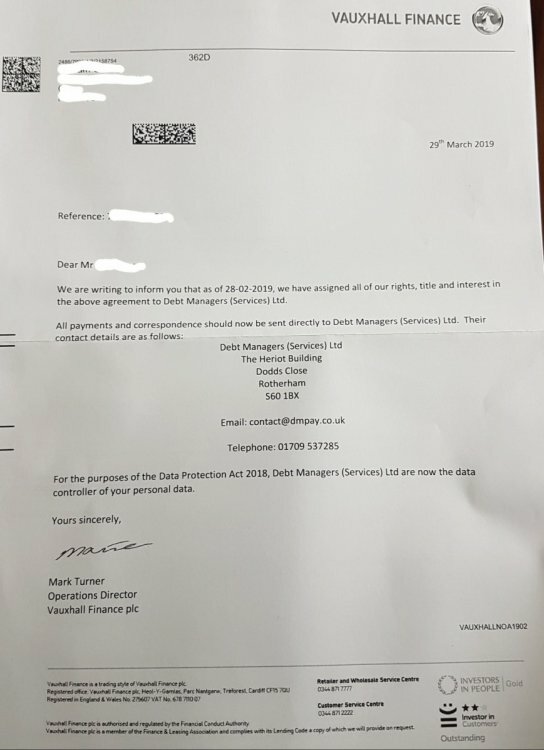 Is there a chance of getting rid of them ie sending prove it letter and hope they never collated the original documentation ? so what happened to the car? The car was given back early on in the finance period. I refused to pay as it was being investigated what happened, I subsequently gave the vehicle back as I didn't want it due to the discrepancies in price, but I lost so set up a plan with Vauxhall and have been paying ever since . so you got stung or VS when it could of only cost you upto the 50% mark. I swapped another Vauxhall car in for a smaller model and was told the HP would be written off the price and only the new car would remain. This wasn't done and I went from a 9k car to 15k with the remainder of the first car added to the price. I lost the case gave the car back and still have to pay. I don't mind saying but it's embarrassing, it was a friend that sold me the car, told me not to worry all was in hand and then shafted me. Ultimately my fault for not reading the paperwork but it was a close friend. Well you wont be making any further payments to either Vauxhall or Debt Managers Services Ltd. 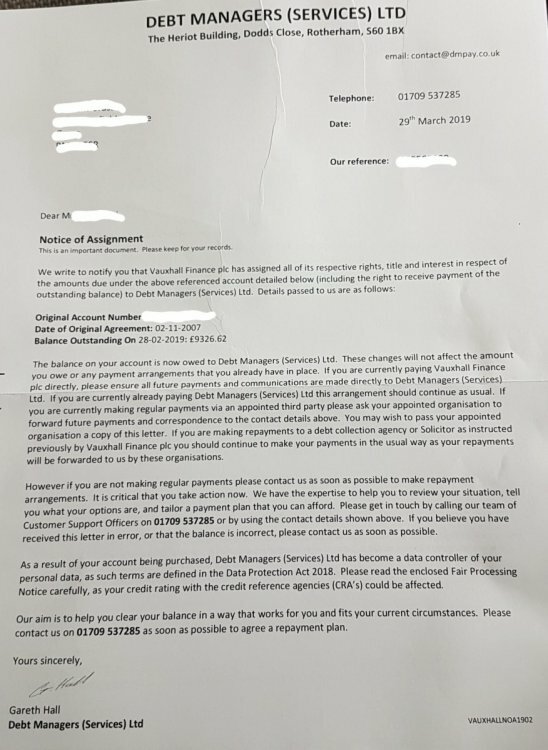 Section 79 goes to Debt Managers Services Ltd. Try to work out what you have paid in total so far. Many thanks for helping also. Just to clarify I 'should' cancel the DD to Vauxhall and then refuse to pay any monies to the other Mob untill the S79 is answered before 12 days. This will need a cheque of £1 I believe?. Also and sorry for the negligence but what is the DSAR and what's this for also where can I find this documentation. SORRY can't find the section 79. Section 79 for HP Finance agreements. One last question before I send this all off. If I've been paying to Vauxhall for the last 10 years plus and stop the payment, if the debt company can't reply and supply the information in the 12+2 days will this debt be enforceable? Correct....and if they can supply...we check its validity and the alleged balances etc. Dont forget in the meantime to try and work out exactly what you have paid from day 1. You should be able to see the car's proceeds from auction deducted on your annual statements as well on the year this happened? They definatly told me they didn't have to tell me. In that case would the proceeds of auction be taken off the debt owed ? Yes if it's been processed as VS which sounds like it has, the proceeds of the car being sold at auction have to be deducted from your outstanding balance. If they haven't then alarm bells would be ringing. Do you have copies of your annual statements? If not you should request this as part of your DSAR. I haven't but I will be asking for all of the information held. To be honest I think I've been right royaly bent over. Ok so ive found some paperwork and done some figures........bare with this . Bare in mind the car originally wasn't 14579 but less than that and the Vauxhall seller (my friend) added the remaining HP of the old car to the overall price which I wasn't aware of. I don't have proof of this (at the moment). A deposit was also paid via my (friends) CC (the salesman) as I didn't have it at the time (dodgy) again to which I don't have proof. Which is what the numbers work out as give or take £10. I have sent the DSAR to Vauxhall and the s79 to the new debt company hoping the paperwork is not in order. Many thanks and any information or response to my numbers would be appreciated.